Yay!! Software problems fixed. Now I get to go install the hardware only two days behind. Hope I can finish this up before I receive a machine enclosure (Candle machine #1) on Wednesday. On Monday, I have to pick up the fill nozzles/valves from the replacement machinist. That means I can work on a mechmate simulation test, all day Tuesday!! Also, ordered the table from the fabricators today(I needed something to cheer me up after that last post, wow that was dark). Next up on procurement is Laser cut parts.... Sean, you there? LOL my wife was wondering if you were Swan Creek, She has some of your candles and when I told her of your post she wants to go for sure! This might be the first step in her acceptance of this obsession. She says I have been talking MechMate in my sleep lately LOL. Woo hoo, all projects are back on track. UPS o'clock with a few more parts on the way. Fuses for the test. I guess I could start preparing the area where my table will live. I am gonna need a whole bunch of conduit. Hmmm, a conduit bender is probably best found in a pawn shop. I wonder if I go by any pawn shops today? So, I do my simulation test tomorrow, then I start setting up my workshop. Be careful with that lighter 10 10 306 S. Tempting to stack stuff on there and it could bend down (pulling legs in, x-rails out). To go lighter there is fine for the table itself, just have to remember it is not for stacking or standing. If that makes you nervous, weld a thinnish vertical in the center, up to the nearest table cross bearer 10 10 302. 1. Are the cross-supports offset by about 4" to one end of the table? 3. Check across the table with a tape measure for the dimension at top right corner of drawing 10 10 300 W. It should be parallel within about 1/8", or whatever tolerance the contractor gave you at the start. 4. Sight down the length of each beam to see if they are still fairly straight. They didn't drill the holes for the spoilboard? #3. Was surprised, but within the precision of the tape measure I was using, table is dead on square. #4. Once again, within the precision of my eyesight, totally straight, level and square. Sounds like you found a good welding shop! Congratulations! Yeah, let me give another plug for Selders Welding in Dundee Michigan. For my other activities, I drop off a drawing, I come back in the morning the next day, never pay more than $10 to $20 for the part. Since I found them from the table search, Ive use them probably 10 times now. Fast, good cheap work every time. Next step is the paint. Looks great Greg. 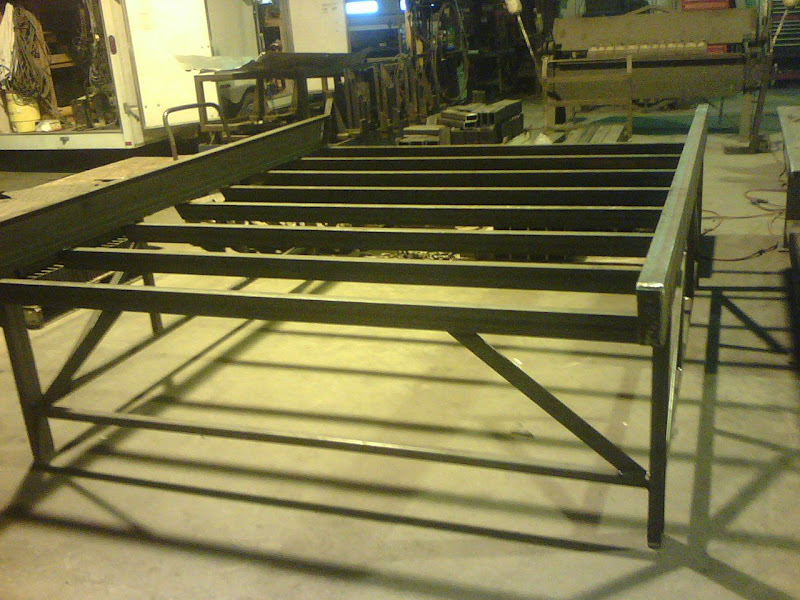 Are you going to tackle welding the gantry and car? Right now I am doing things on it that are big and well defined because I just crossed the "now i have to do a million little things threshold" on another project... So I can currently make progress... on a jig to grind rails, procuring laser cut parts, setting up shop area. Time to drink coffee BBL. P.S. Welding shop did a really nice job on my heated tank filling head, but I need to drill and tap own holes on next machine because as nice a job as they the tapped holes are all out of plumb by multiple thousandths and I have had to work around that for a while. So I guess to answer Doug Fords question... My money supply is greater than my time so I will probably outsource the gantry and car welding as well. On the other hand I am still getting blank stares (previously referred to as the PITA treatment) when I talk about outsourcing rail grinding. Last edited by GregA; Wed 06 February 2008 at 09:23.. It must be a wonderful feeling to have more money than time. My wife has always endeavored to ensure that I am short of both. Small business is all grown up Approaching 20 million annual sales (I get big money get to keep little money ) (sigh another aside... I am at a level where a million dollar increase in sales year over year is no longer good news...) At this level if you don't spend it the government takes it from you. Unfortunately you still have an employer, his name is Uncle Sam. As he doesn't seem to give much of a damn how I spend my time, as long as I send him his cut, I wouldn't have it any other way. Also... With all these laser cutting firms turning away $500-$1000 dollar jobs I am starting to wonder if I am in the wrong business, and if I shouldn't be looking at the laser cutting business... Generally I am all over the $500 to $1000 dollar jobs... What are they doing that they don't call back the people with finished part files wanting to spend a $1000??? I too have seen many laser firms turn down a $500 job, or quote me $1500 or $2000 so that if they got the work, it would be worth their while. Guess they are too busy for my work. A few months ago, I started making the Mechmate part files into emachineshop files... Couple thousand dollars at least. I just picked up my laser parts today from the laser cutter . He doesn't do bending just laser cutting, so I will have to take them to another shop, that I have already contacted, to have the parts bent. The mamba parts including the the rail grinding skate and the mini grinder jig for cutting the angle to size (a total of 25 pcs) cost $220.00. I had him run 2 sets for me because they were so cheap. Who knows, I'm having so much fun, maybe I'll built more MechMates. He said he would do more sets, no problem. Hope to get the bending done, next week, for less than $75.00. We'll see. Not sure what you mean here. Could you elaborate? I was just comenting on the lack of interest in small jobs. Thanks, I didnt realize it was an online machine shop. Thanks for the link. Dont think I will shop there though. Is the shop, where you are getting your table made, capable of bending up to 1/4" steel? If so, I could probably have the laser cut parts made here, in Canada ,and you could have them bent in MI. I could meet you somewhere near the bridge to make the transfer or I could ship them to you. I don't know how much the shipping would be (or customs/duty) but, if you have no other way of getting the laser parts, it is a possibility. The cost $220.00 Cdn. for mamba parts unbent. Yes, I think (assume) they could, I will talk to them about it today(and end the assumption). I had them build me a motor mount bracket the other day that was 3/16ths. But I will verify. I still haven't checked with commerce industries yet because I was waiting on hearing about the parts from Alabama also but they have a website at commerceindustries.com and they are here in Michigan in Wixom.